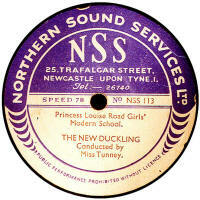 British 78rpm record labels whose name begins with N. Using the letter links below you can see pages for other letters. 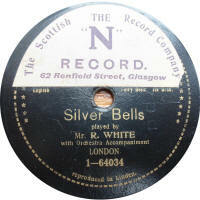 N This is a paste-over sticker dating from pre-WWI, used by The Scottish Record Company of 62 Renfield Street, Glasgow. 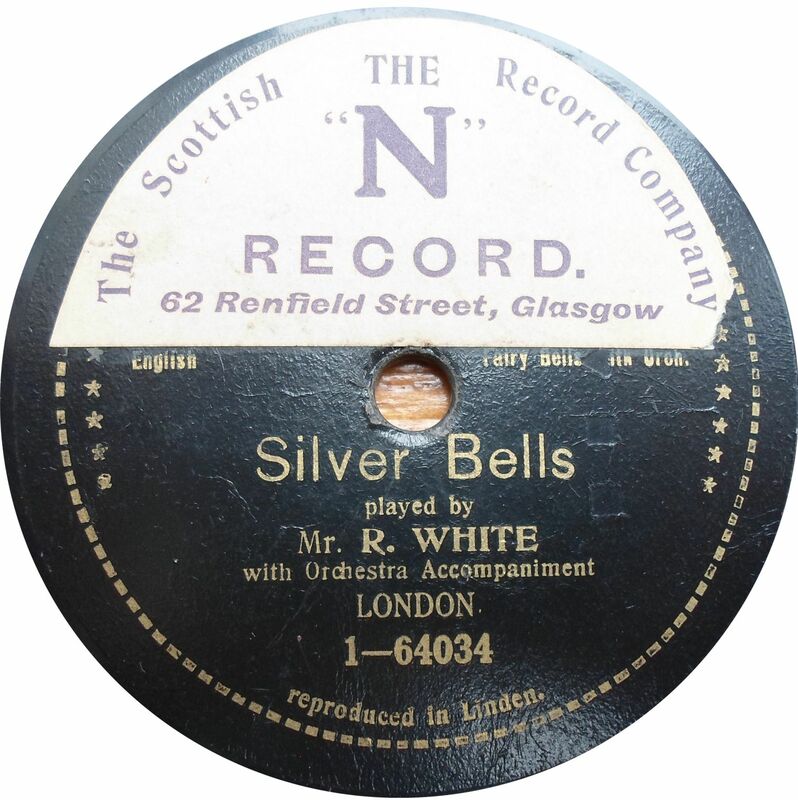 Investigation into this by Bill Dean-Myatt (compiler of the Scottish Discography) could find no record company of this exact name, but at the address shown in 1908 was The Renfield Street Showrooms, selling pianos and organs. 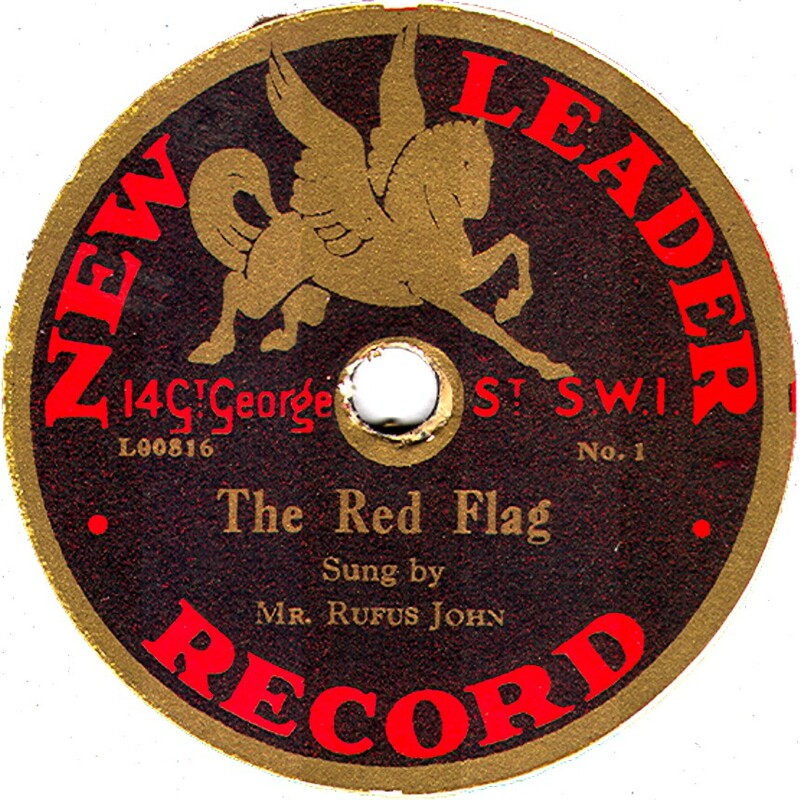 in 1913, R. Felous Henn Ltd was formed (at this address) with the purpose of selling music and musical instruments. This would seem a likely date for these records to be available. This example is pasted over a "Favorite" record and there is no attempt to hide the place of manufacture, so it would seem these pre-date the outbreak of war in 1914. It is not known the significance of "N" for the record label name. Thanks to Ivan Ruddock for providing the label image. 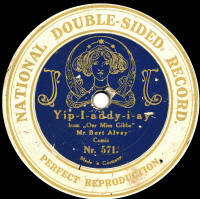 National These two different labels styles date from about the same period, but see also National Scala Special, below. The first one (National Double Sided) was derived from both Edison Bell master (made in England) and Beka/Lindstrom masters and manufactured in Germany. It is not known for whom they were produced. 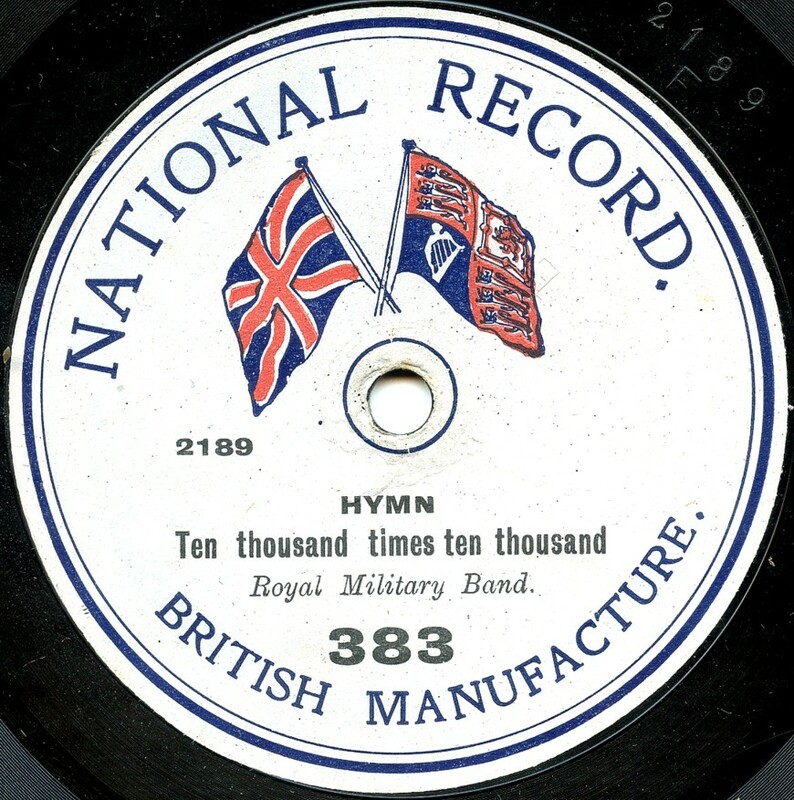 The second style was an Edison Bell product dating from 1910, these were a 10½" records with a 3-digit catalogue series, sold under a tally-man system in the same way as John Bull records. 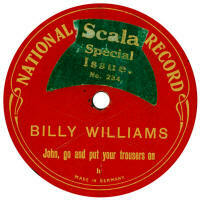 See also "National Scala Special" records below. My thanks to Norman Field for providing the inage of the first label. 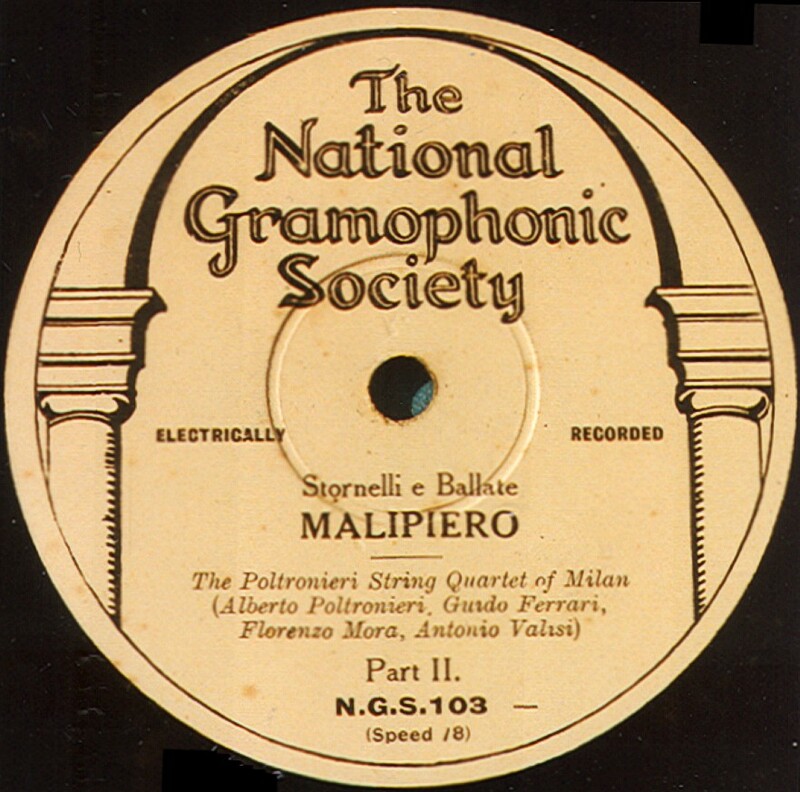 National Gramophonic Society This society was formed by Compton MacKenzie, the founder of The Gramophone magazine, in 1923. The first records, recorded & made by Columbia, were issued in late 1925. Subsequent issues were made by Parlophone, Crystalate & Vocalion, many of the latter being electrically recorded. In 1928, Columbia once more took up the making until the label and the society were wound up in 1931. 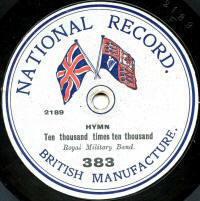 The records at that time were 6/- each. 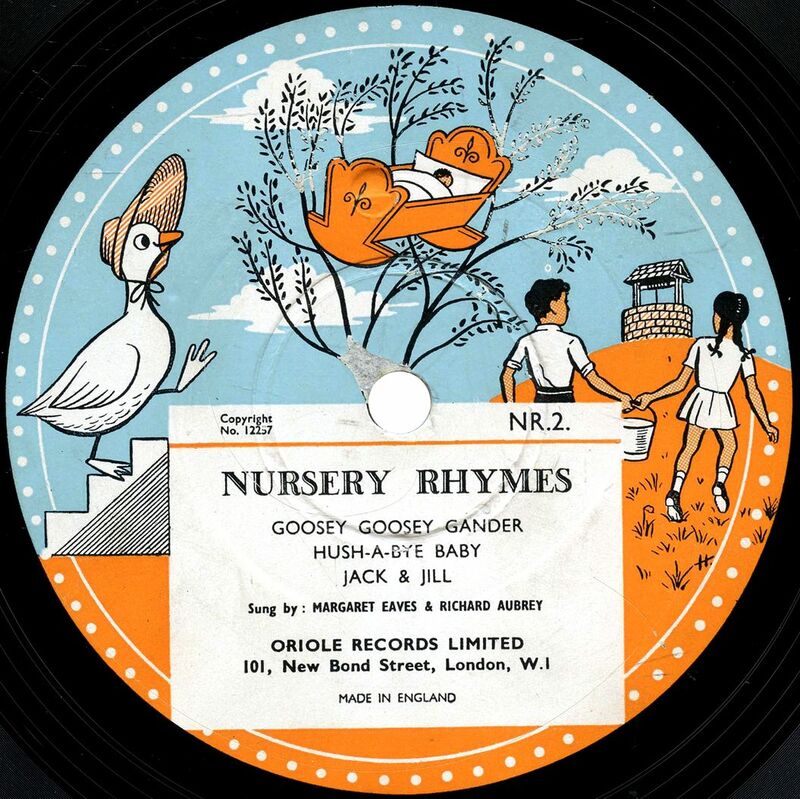 The records had no catalogue nuymbers to start with, just an alphabetic code, starting, logically at A, running to Z (but omitting J & U) before continuing from AA, BB, CC up to ZZ, then AAA, BBB and so on, until reaching TTT. From then on they were had conventional catalogue numbers starting from NGS-69, with all the previous issues, when re-pressed, being allocated numbers from NGS-1 to NGS-68. 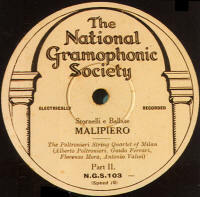 The highest number, issued in Novembr 1931, was NGS-165. Depsite the disbanding of the society in 1931, Frank Andrews tells us the electrically-recorded sides were still available until 1962! Has anyone produced a listing of this label yet? If not, I think it is time to do so; please send full details of any you have to me and I will start the ball rolling! 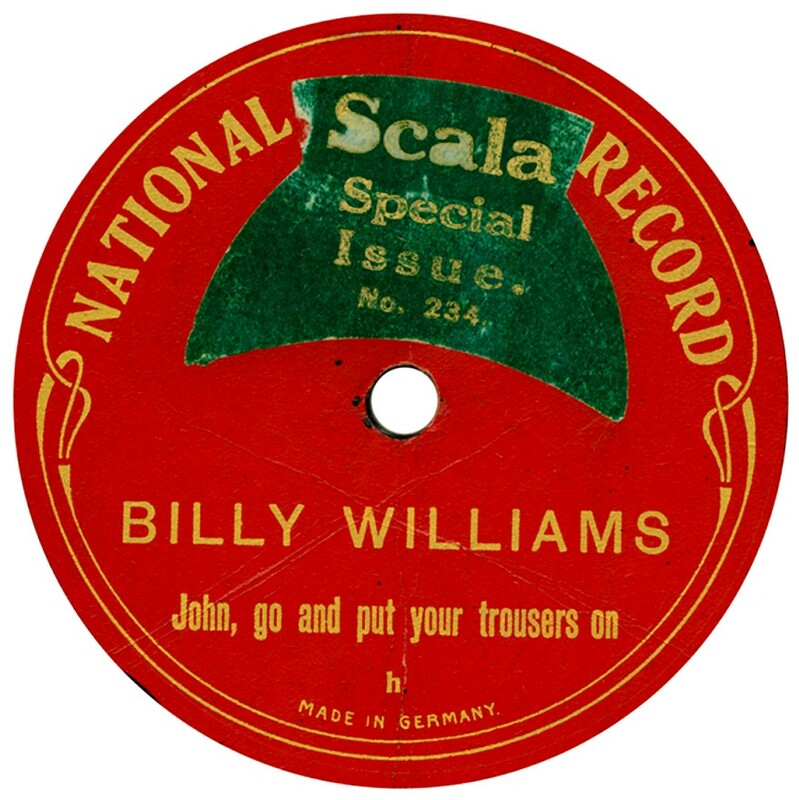 National "Scala Special" A Pre-WWI German produced record using Beka masters. Some copies have a sticker which states "Scala Special Issue" (see first example) whereas some are blank or have the copyright stamp (see second example) . Some have a catalogue number, possibly of the standard Scala issue, while others just have a letter code, different each side. All issues seen are by Billy Williams. 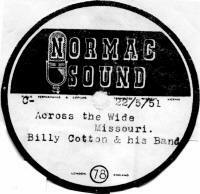 Thanks to Norman Field for providing the first label image. Neglected Masterpieces Neglected Masterpieces were both 10" & 12" in size and date to 1949. 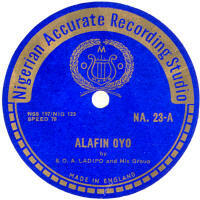 They were made by Oriole Records Ltd. 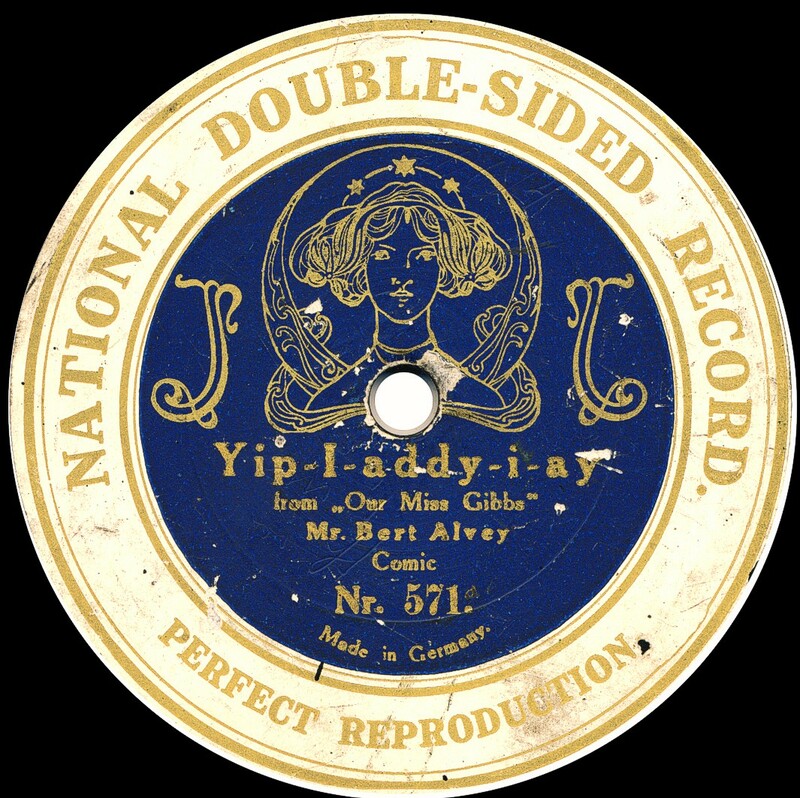 The first few issued used maters from the Classic label in France, but subsequent issues were their own recordings. The records were pressed by Oriole. It is belived there were at least 19 records in the series. Thanks to Bill Dean-Myatt for the label image. Neophone Neophone are believed to be the first vertical-cut disc on the British market (excepting any "toy" records) and they appeared in 1904. They were single-sided and made of cardboard coated with some sort of enamel. It was the invention of Dr William Michaelis; the groove was U-shaped (like Pathe). There were many sizes produced from 7½" to 20" (the latter with a playing time of nearly 10 minutes). The prices also varied, from 6d to 10/6, depending on the size. Later on there were some double-sided records made of "Neoline" which was similar to the standard shellac used for other records. 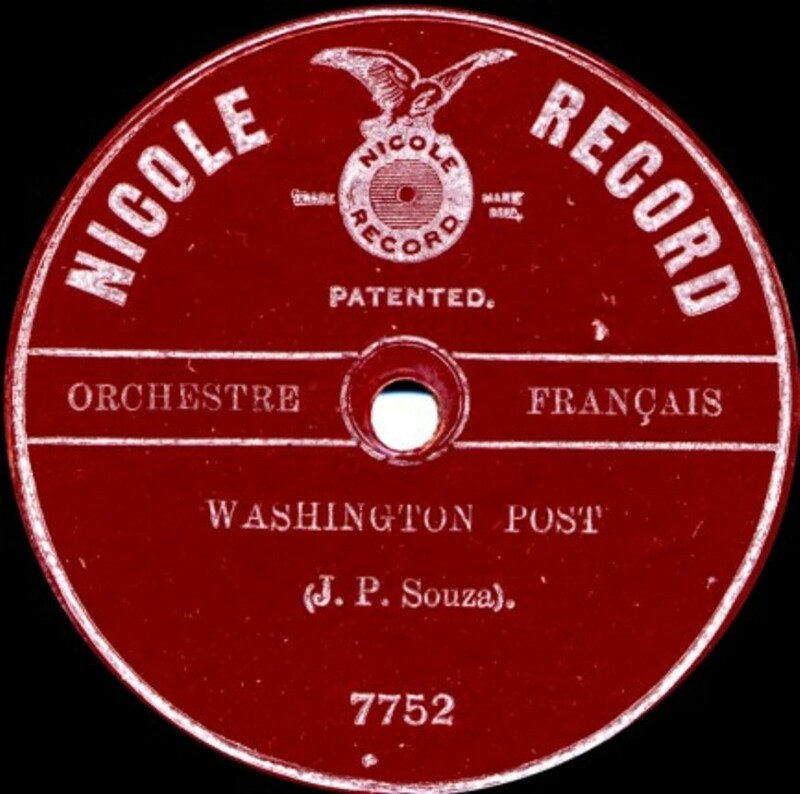 In 1907, record production was taken over by the General Phonograph Co, and some white records were produced, but production ceased altogether in 1908. 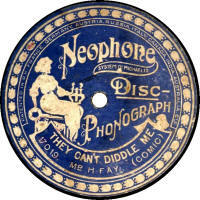 Neophone records have never been easy to find, but even so, I've never seen one, except in collections. 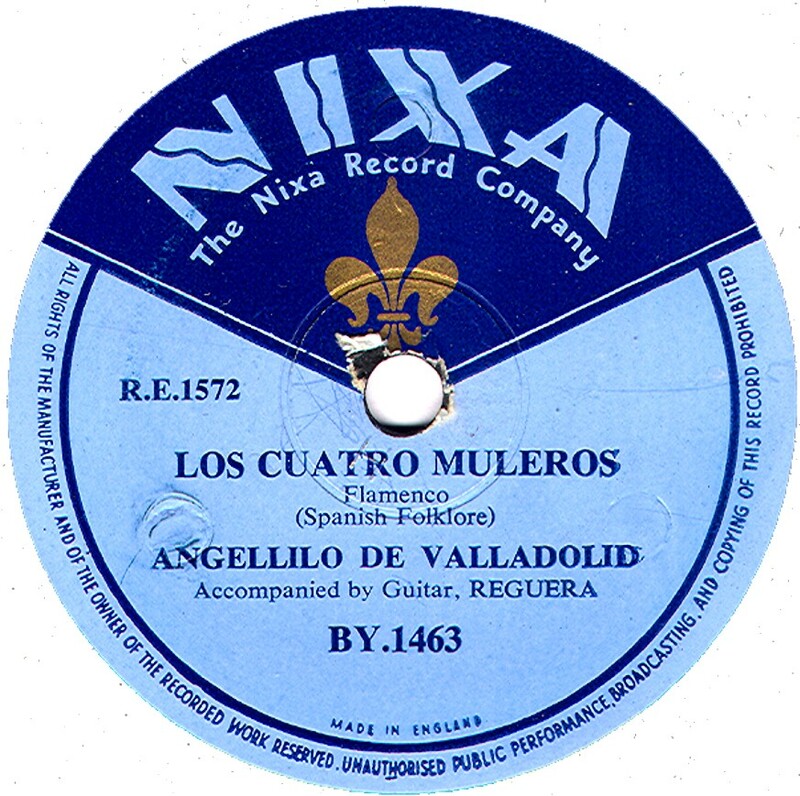 Frank Andrews published an extensive listing of this label in "Talking Machine Review" in 1978 (issues 51 - 59), which I have transcribed for this site. Thanks to Rainer Lotz for the label scans. 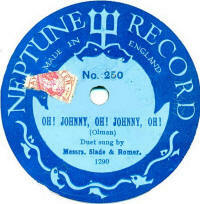 Neptune These were produced by Crystalate for Curwen's, the music publishing company, from 1917 to 1919. The masters were from Guardsman. They initially cost 2/-, rising to 2/6 in the autumn of 1918. The catalogue nubers ran from 100 or 101 up to about 276 (the highest found to date). The initial release was intended to be labelled CORONET, but this was challenged by Pathe Freres, as it ws a Pathe registered name. We are told that all CORONET records were recalled and destroyed, but in reality they may never have been manufactered. Or were they, and will one eventually turn up? 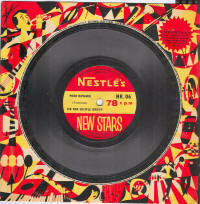 Nestles New Stars These were 7" records on a square coloured background, first sold in 1957. 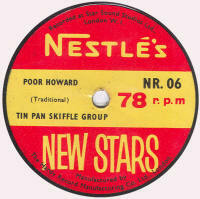 There were 10 different single-sided records initially available from Nestles. To get one you had to send 3 wrappers from Nestle's chocolate bars, a postal order for 1/6 and a coupon. 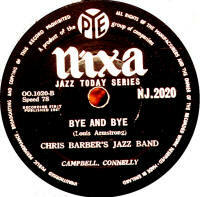 There were later releases (or maybe one more 10-record release), the highest found to date being NR-20. 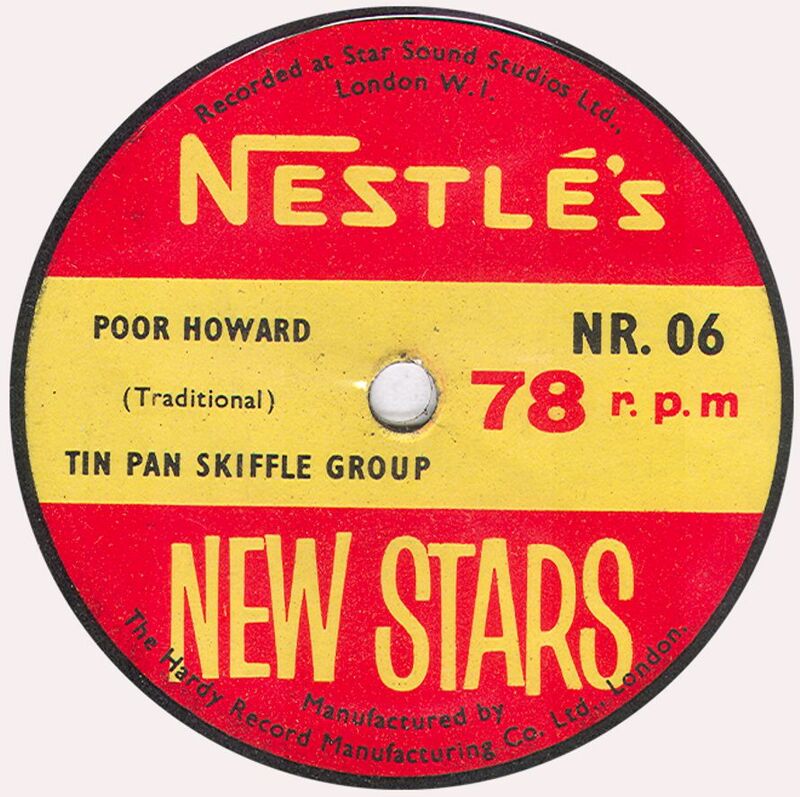 The records were recorded by The Star Sound Studios of Rodmerton Mews, Blandford Street, London W1, and made by The Hardy Record Manufacturing Co, of 62, Oxford Street, London. 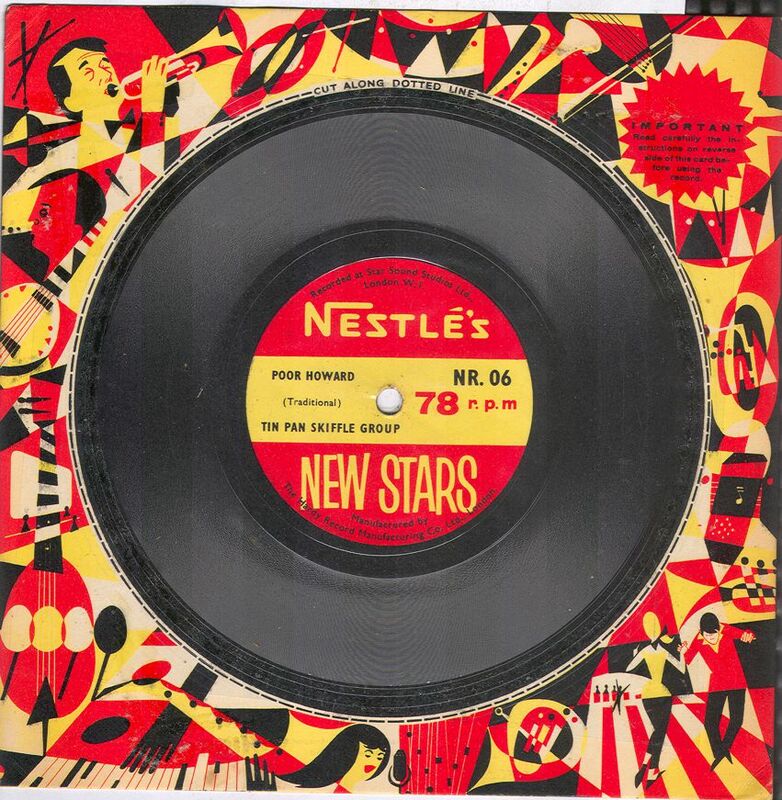 Frank Andrews notes that at the time, Nestle's were occupying the former buildings of The Universal Music Company, at Hayes Middlesex, where Vocalion records had been made in the 1920s. Thanks to Bill Dean-Myatt for the images. 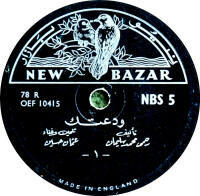 New Bazar Thanks to Bill Dean-Myatt for the label image. 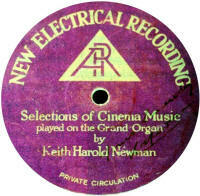 New Electrical Recording Frank Andrews reports that these are Columbia recordings, either issued normally on Columbia or Regal in the 1920s. It looks like an over-stuck label to me, but the significance of the logo of "AR in a triangle" has not been found yet. The few reported exampl;es are all of organ recordings. 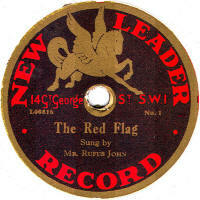 Label image from "For The Record" No. 26. New Leader This was the successor to Lansbury's Labour Weekly (q.v.) following the Lansbury newspaper being absorbed into the Labour Party's official newspaper. 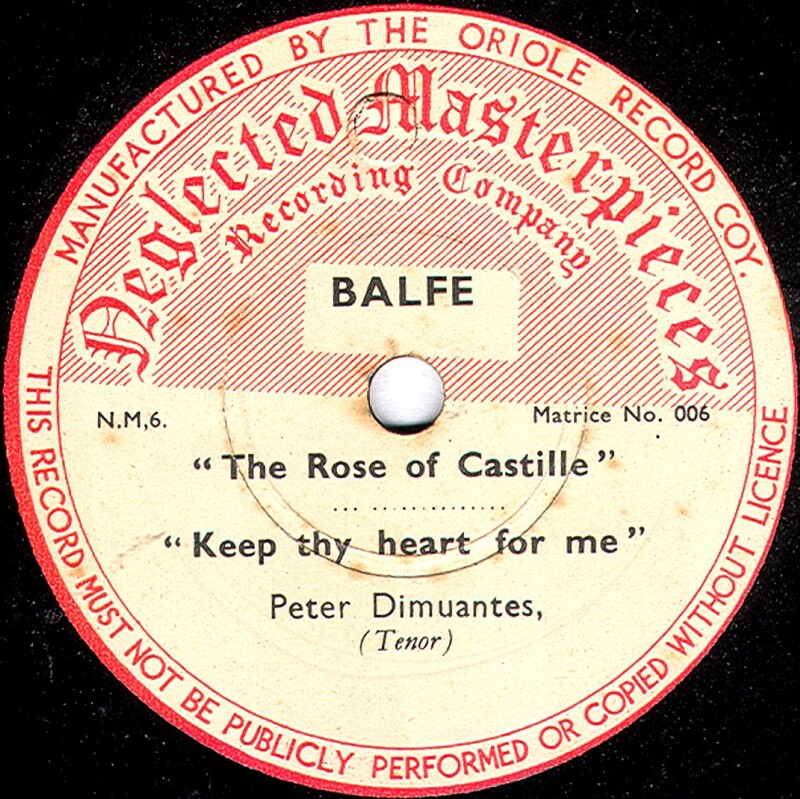 As with the Lansbury label, most record companies refused to have anything to do with such political matter, and they were pressed by Pathe with plain white labels, upon which the New Leader labels were pasted by the party. 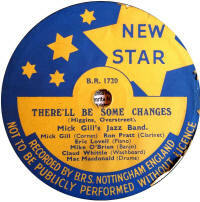 New Star This was a label from the private recording company BRS, of Nottingham. Thanks to Robert Girling for the label image. Nicole One of the very earliest disc records, Nicole records were the first to be manufactured in Britain and were made from a semi-unbreakable material which looks a bit like linoleum. This was a product of the fledgling Crystalate Manufacturing Company, whose business was manufacturing in synthetic materials. The sound is rather rumbly because of the material, though this wouldn't have been much of an issue when played on acoustic gramophones of the period. 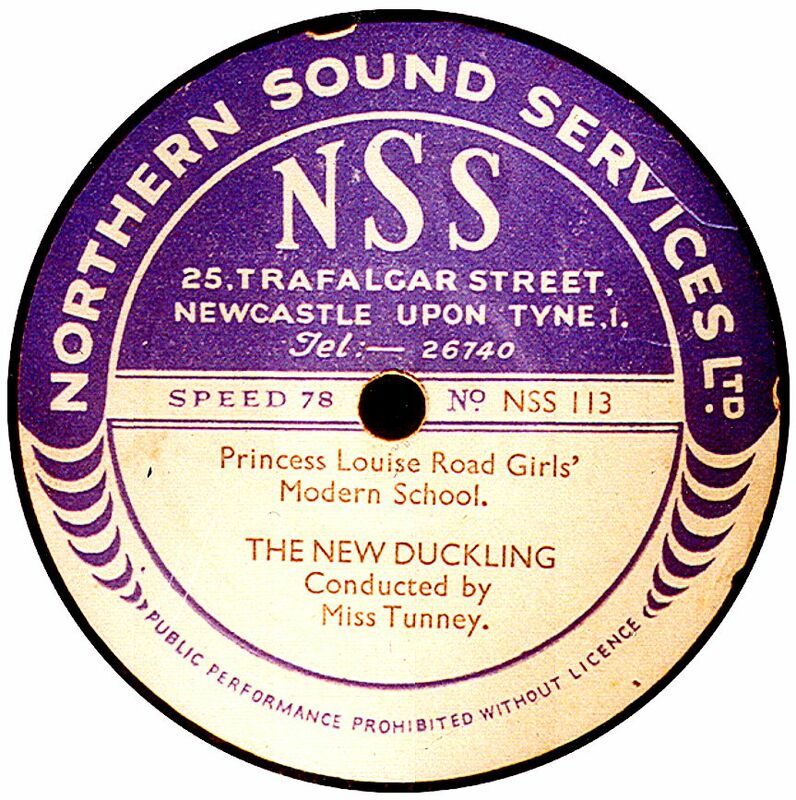 Nicole Freres of Ely Place, Holborn Circus, London had been musical box manufacturers since 1815, so it was natural that they should branch out into records. 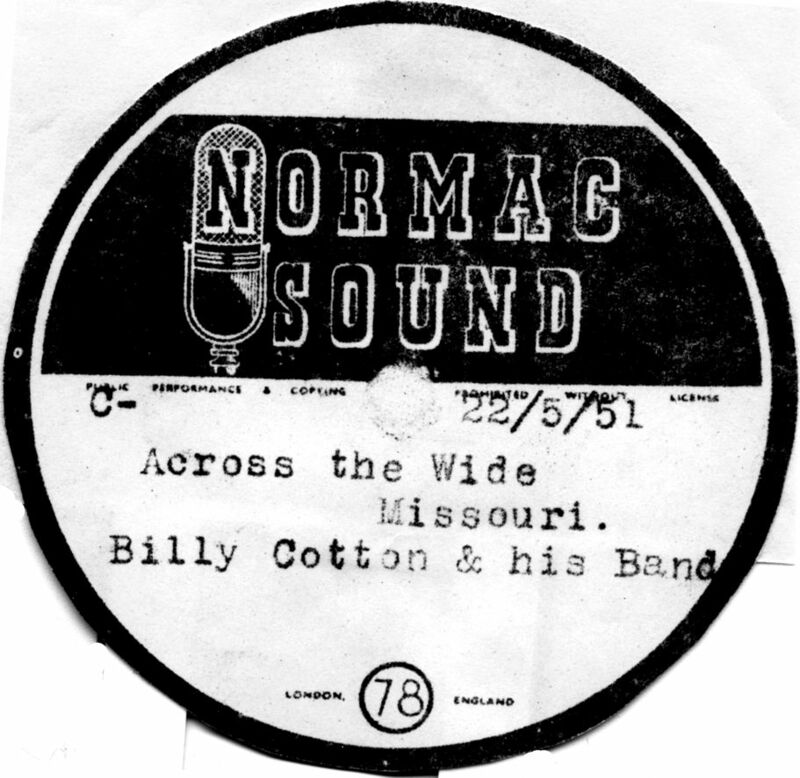 Nicole records were available in 7" or 10" size and were initially single-sided. In 1906, the company went into liquidation due to the failure of their main musical-box business. A listing of this label was published in 2001 by Michael Kinnear of Australia (long out of print, unfortunately). 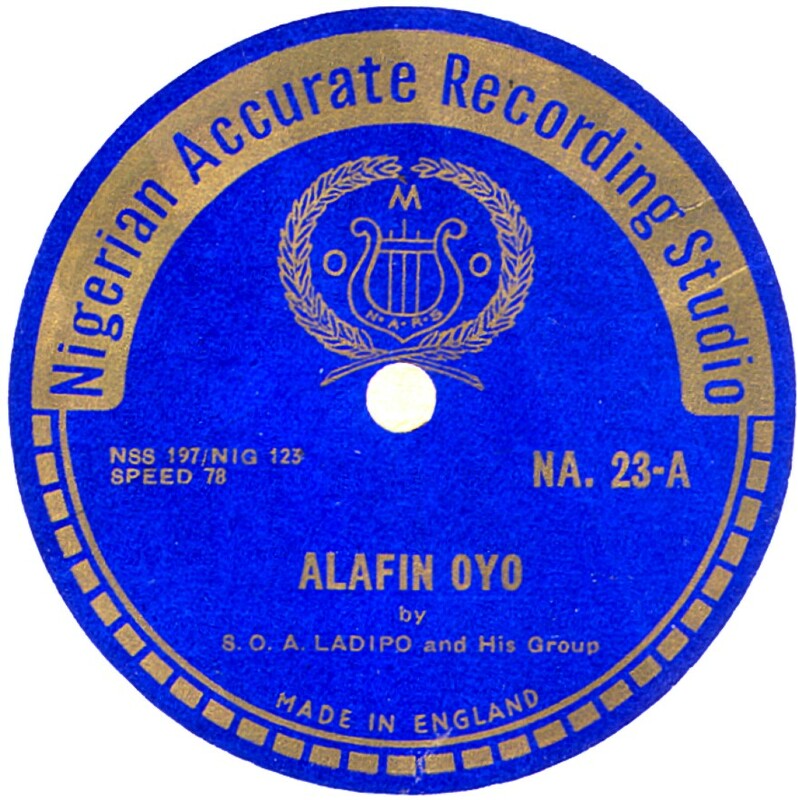 Nigerian Accurate These records date to the late 1940s and early 1950s and were produced by Northern Sound Services of Newcastle-Upon-Tyne. Nixa Thanks to Bill Dean-Myatt for the label images. 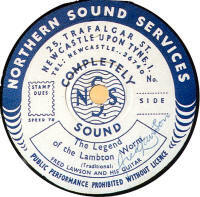 Normac This solitary example on this label is very coy about its origins, stating only "London, Englad", unusual for what is assumed to be a private recording company, which usually like to advertise their address on the label, to encourace customers. 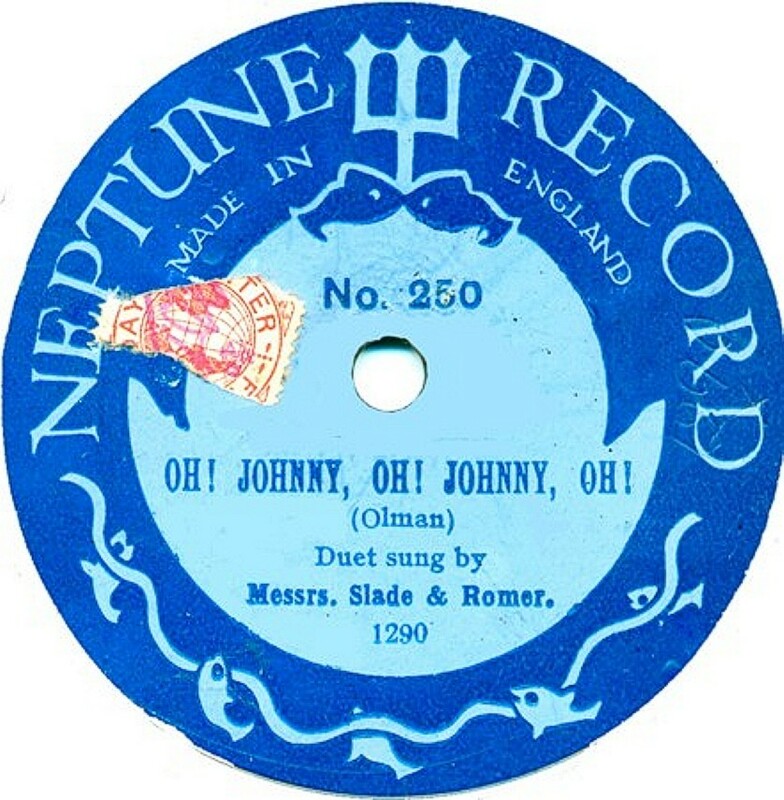 The recording seen here is likely to have been pirated from a Decca record. 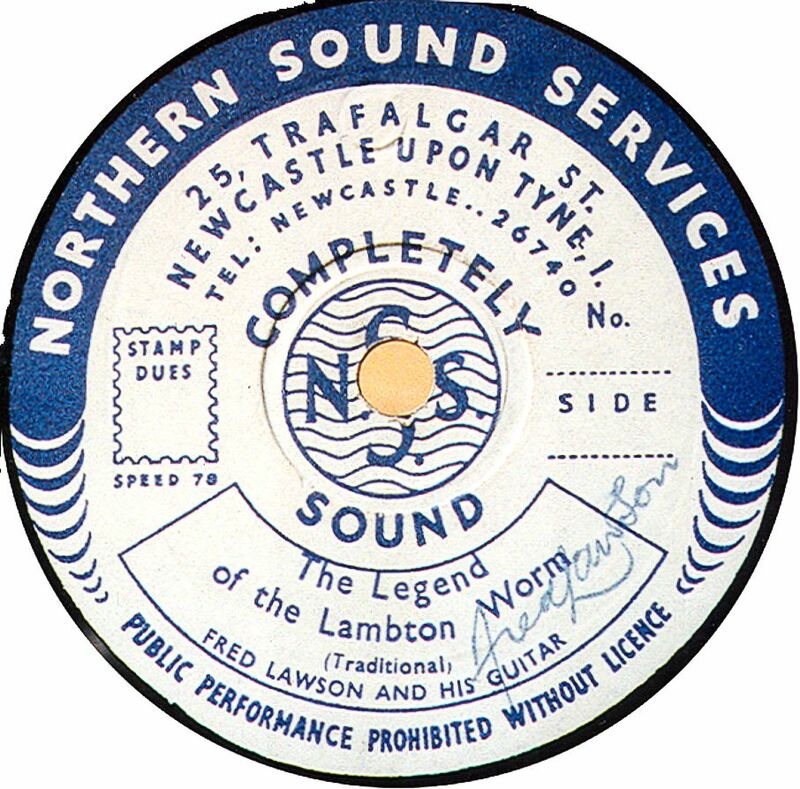 Northern Sound Services Northern Sound Services was a provincial recording studio, based in Newcastle-upon-Tyne in the years after WWII. 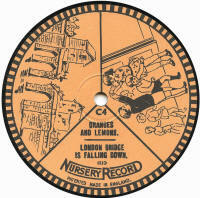 As well as their own label, seen here, which was for private issues, they also had a commercial label, Manor (q.v). The recording engineers were Derek George Lucas, formerly a BBC worker in the North, and Frank Wappatt. 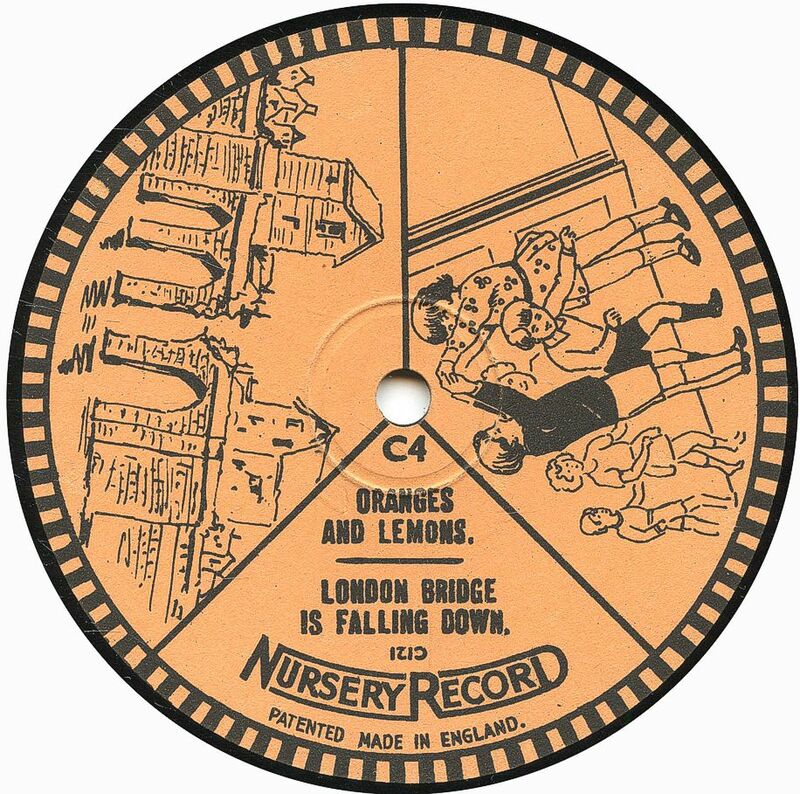 The records could be eitherdirect cut (acetate) or normal pressed records, the latter made for them by Oriole Ltd.
See last "Hillandale News" and FTR No 2. 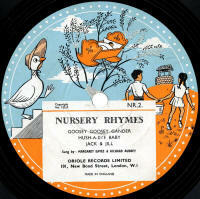 Nursery Record This example is actually a "Kid Kord" record, but the label name here is "Nursery Record". 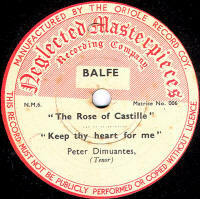 This represents a late pressing, allegedly by Decca, following the 1936 agreement between British Homohpne, EMI & Decca whereby BH agreed to withdraw from producing their own commercial records. Frank says that Decca took on the pressings of Kid-Kord but then later repressed them as seen here with a much plainer label, which must have made them less attractive to theur young audience. 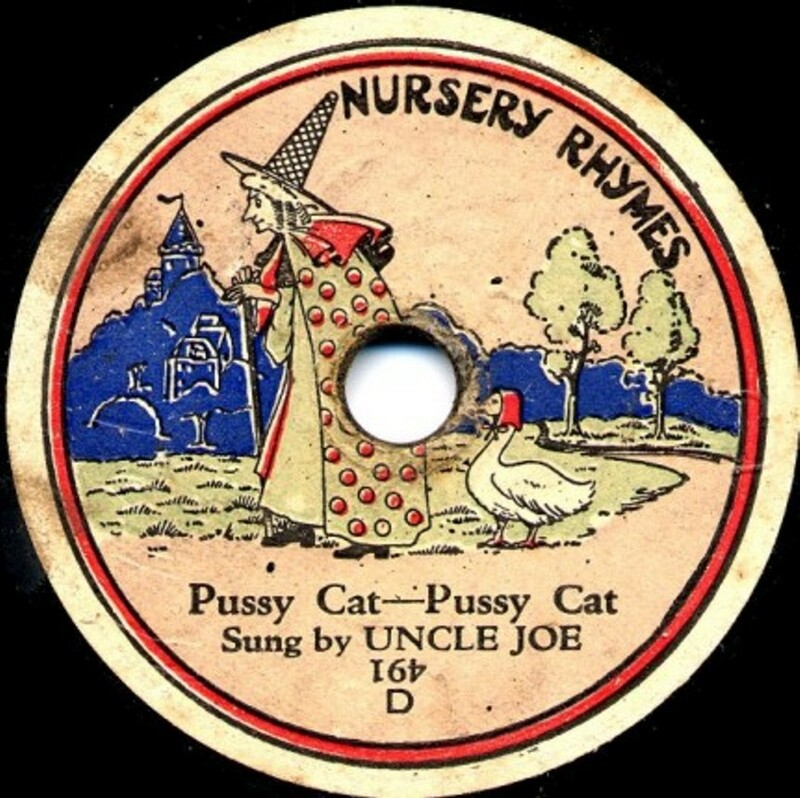 Nursery Rhymes A 5½" (later 6") disc produced by Crystalate to "compete" with the two "Fairy" labels produced by Edison Bell and Vocalion, Nursery Rhymes issued just that during a short life in the 1920s. 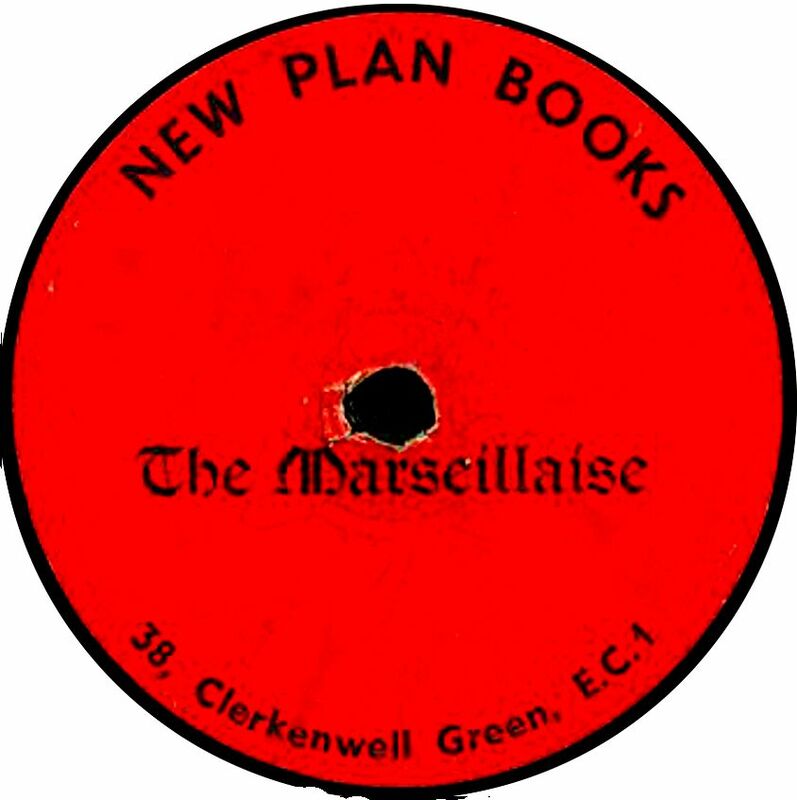 There were no catalogue numbers as such, each disk was identified by a letter (the one shown here is "D"). Whether a full 26 discs (or more?) were issued, I don't know. 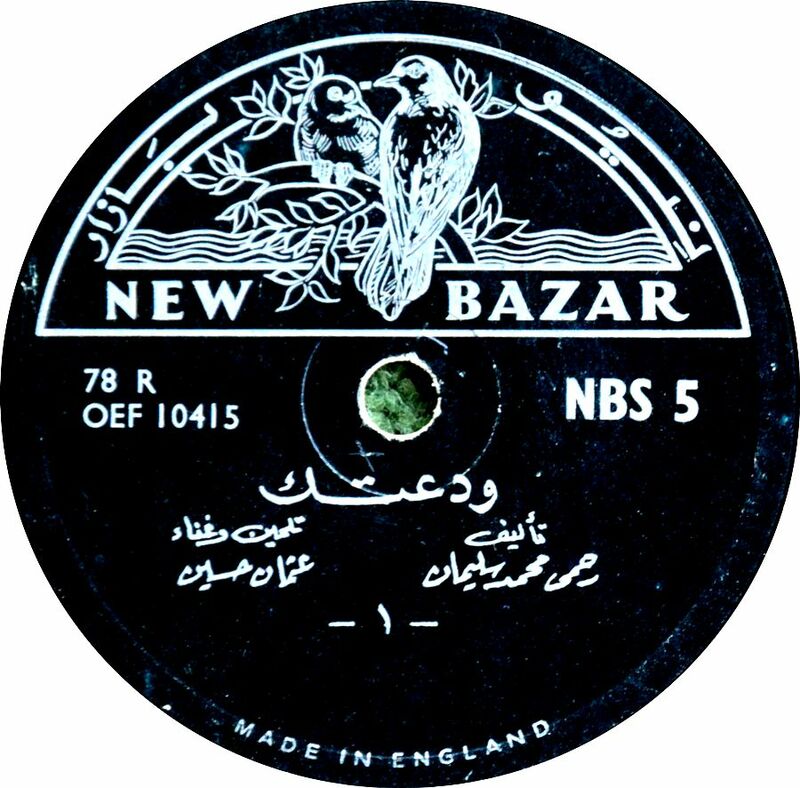 The same name and label design was used for some 7" discs, again with alphabetic "catalogue numbers". Thes duplicate the 7" Victory series and will be found on the Victory 7" page. 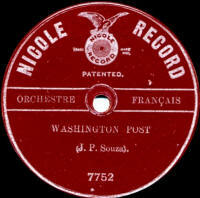 The second image shows a record of a later vintage, manufactured by Oriole, about which I know nothing at present.